Weely weely excited about today, you guys. Too early in the morning for puns? 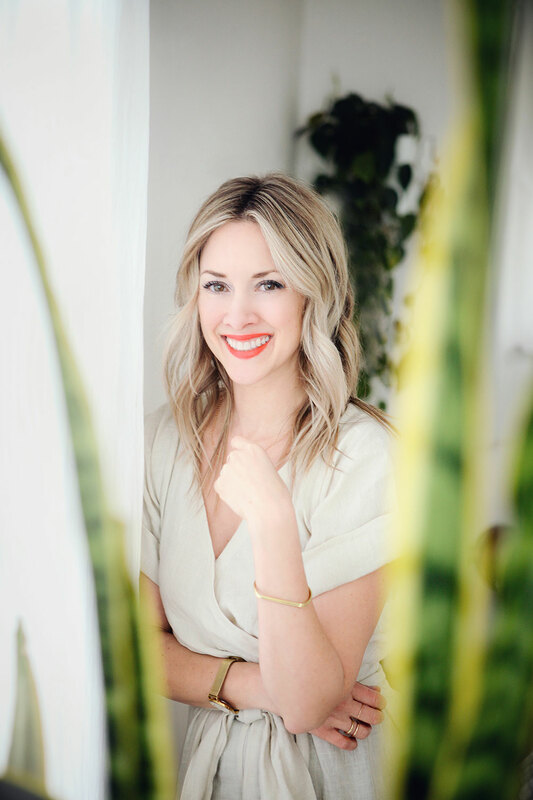 SO, in my make believe world, Catherine McCord and I are the bee of effs, and we spend long afternoons on an enormous wrap-around porch, discussing lip gloss, organic belly butters and ways to trick our kids into eating sardines with saffron aioli. Also, in this make believe world my hair is two shades blonder with a sheen that would knock you flat into next month. But we can’t all have what we want, NOW CAN WE. What I’m trying to tell you is::: Weelicious Book Numero Two is out and I have twoooooo copies to give ya! I’m getting some excellent practice with this book, I can honestly say. Once my kids turn two I’m pretty much going to give them each a copy with a compass and a canteen of water and tell them we promise to send them postcards from Europe. MOM, I’m kidding. We’ll probably just be in New York or something. This book is something else. The flavors are sophisticated enough for us oldies to enjoy, but super fun and simple for the wee ones to get a kick out of. It’s basically my husband’s favorite book ever to be published, ever ever. Oh my gosh that is seriously gross. I’m so sorry. Want a copy? Yes, yes you do. All you have to answer me this one question in the comments below and you’re entered to win! You can also follow me here, here, here and here, and leave separate comments on this post letting me know. Simp to the simp, right? My question IS: What’s the weirdest food you tricked your kiddie (or SPOUSE, DU DU DUUUUUH) into eating? Spill it, yo. Heat a grill, sauté pan or panini press over medium high. In a small bowl, combine the tuna, celery, Dijon and mayo. 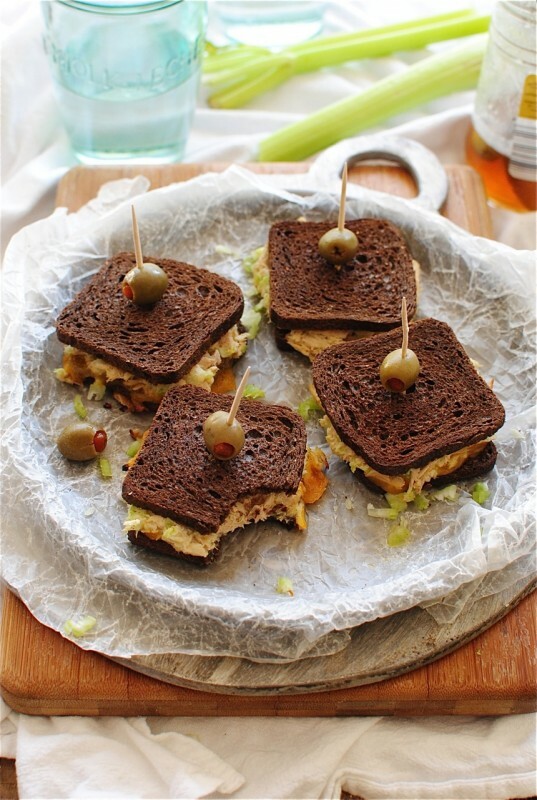 Evenly divide the tuna mixture among 4 slices bread; top with cheese and the other slice of bread. Grill for 2 to 3 minutes on each side, or until the cheese has melted. Serve it to your face! I mean your littles. And then your own face. Now I seriously want blonder hair. Ugh. 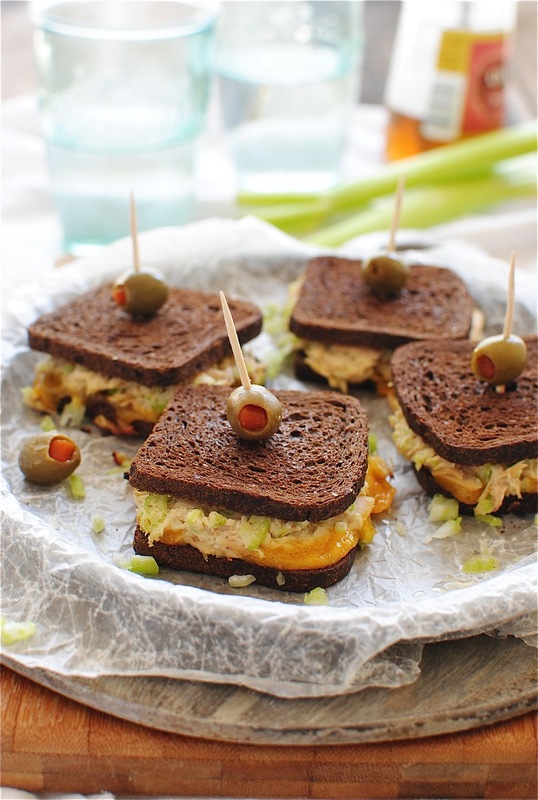 159 Responses to Pumpernickel Tuna Melts & a Weelicious Giveaway! Avocado Pie! It takes just like a mojito and hubby had no clue! He thought the green color was from the mint only! Bahahahhaha! I made gluten free strawberry shortcake for the fam and no one, not even my husband who claims he can tell everything that is in a recipe could tell! No kids yet, but over the last 4 years I've done a good job tricking my husband into eating sweet potatoes and avocados. Still working on olives. My husband used to think he didn't like SALSA. Weirdness. Now he's obsessed with it. Peanut butter and lentil soup sandwiches. I was pregnant at the time, and it was AWESOME! My husband maintains that PBJ and bacon bit sandwiches are weirder, though. My "I dont eat green stuff" son loved my spinach and artichoke chicken bake. I've snuck cilantro into things... and my husband (the one who tells people he's allergic to the stuff) didn't even notice!!! Oh, this looks like one awesome sandwich too! I make pesto with spinach and my cousins love it. So pretty, Bev!!! And love Weelicious! I sneak carrots and spinach into my meatloaf. Not too original, I guess, but it works! I could eat a tuna melt every day of my life. I'm weely glad you shared this recipe. Oooh love the looks of this one! One time I made the husband eat soyrizo...like chorizo made of soy. He didn't hate it. Until he learned it was soy. I always reduce the amount of sugar in recipes (or use a healthier substitution) and nobody is the wiser. Those are some tasty looking tuna melts! Definitely mushrooms in any beef dish. He still doesn't know. Calamari! My daughter absolutely loves it. At first she had no idea it was squid. She eats the rings and tentacles. I follow you on Twitter as menusmeals4moms. I follow you on Instagram as Menus and Meals for Moms. I trick my husband into eating spicy things. He is adamant that "not everything needs to be spicy", but come on, it does! I'm always tricking the hubs into eating dishes made out of Cauliflower (pinch of yum style). It's the best. He's a champ. Definitely tricked my husband into eating beets by shoving them in ravioli and I also just recently snuck an entire eggplant and a bunch of mushrooms into "meatballs" that weren't even made with any meat. I felt like an evil genius! avocado chocolate pudding- he had no idea! Velveeta-I added to an enchiladas recipe I made and he "ooohed" and "aaaahed" at how cheesey and creamy the sauce was. He thought I nailed the bechemel...I did, with the addition of processed cheese! Tee-hee. I don't like to eat dairy, but my husband lives for it. I made a lasagna using only homemade "cashew ricotta", but failed to mention to him that it was a vegan lasagna. He said it was the best lasagna he had ever had! His sister visited the next day, & after having a leftover square for lunch she raved about it too. That's when I broke the news. All my husband said was, "I did think it was strange that you were eating so much cheese!". Mushrooms in a creamy soup. Mushrooms! Yes, in green bean casserole. haha trickery.. I don't have kids but when I was younger I got my friends to try "Kalles Kaviar", a Swedish caviar in a tube that I love. Mmmm...I wish I was eating these tuna melts for lunch! Love Catherine's new book! I once made a spaghetti sauce with veggie ground round (fake hamburger, yo) and served it to my entire family. They didn't have a clue. I'll never let them forget that one. PS. These tuna melts sound delicious! 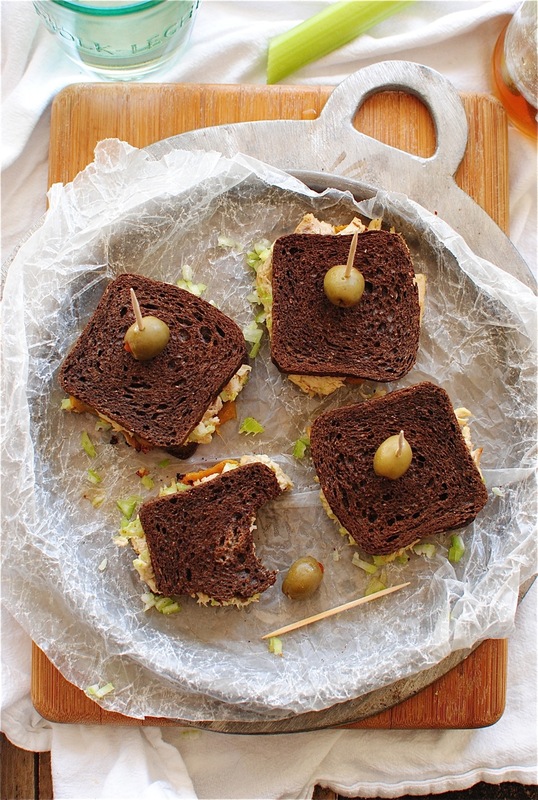 Love the pumpernickel bread too. I made a recipe for chicken burgers that had grated zucchini and carrots in them. Since the colorful flecks were very noticeable I called them "confetti burgers". My veggie-avoiding daughters ate them up (literally!). It's all marketing....! Spinach & apple muffins (the tricky part was spinach. She likes apples.) Also sweet potato muffins. I've learned that if it's in the shape of a mini-muffin, I can pretty much get her to try anything! We tried to trick the kids into eating liver. Yes I know We are bad parents. I actually don't like it either and they thought they were about to eat beef. One smell and they knew something was up. Needless to say they didn't eat it! I follow you on every social media outlet in existence! :) So pick meeeeeee :) my 13 month old is still in the exploration stage of food so he's not hard to trick but my husband despises yogurt and I mean DESPISES! So what better way to sneak it in... In pancakes! So that worked!! Greek yogurt pancakes for the win! We bought sprouted green spirulina sunflower seeds that were yummy and salty and my husband had no clue spirulina was on it..he just thought they were randomly green! As for my daughter, I've snuck in greens, beets and other veggies into her smoothies without her knowing. I've also convinced her to eat tempeh and vegan chicken before. She had no idea. kale since it was in the turkey balls. Loved it. I follow. and subscribe. Not too weird but I have put butternut squash in Mac and cheese. It's delicious! I have also put beets in chocolate cupcakes, mmmmm. I once served my husband the TVP "chorizo " from TJs. The joke is on me though, because he actually loved it, and now asks for this strange food almost weekly. Tricked the whole family into eating vegan cupcakes. They didn't last the morning. I love the sound of this book! When i first meet my husband i cooked him dinner at his place on our second date, nice i know, and before i made it i asked him if there were any foods he didn't like and for some unknown reason i cooked him a meal with all of those things. Food the record he totally loved it and now loves tomatoes, olives and mushrooms! Black bean tostadas. They didn't know there were mashed black beans mixed into the meat. I don't hide anything but I do a happy dance (in my head) when my 4 year old eats a big salad! YES. Salmon. My little kids don't like it. I followed her nugget recipe and told them they were fish sticks. I always put shredded zuchini in my meatballs and stuffing recipes. It keeps them moist and they rarely know. I woudl ove this book. It's week three of packing at our house and I am running low on ideas. These look fabulous! I haven't been able to decide what to make from the book yet! I don't even try to trick, but I do make beets with some honey and orange juice and they gobble it up! Coconut... He hates it and I Put it in granola bars and he had no clue! Those sandwiches look ahhh-mazing. 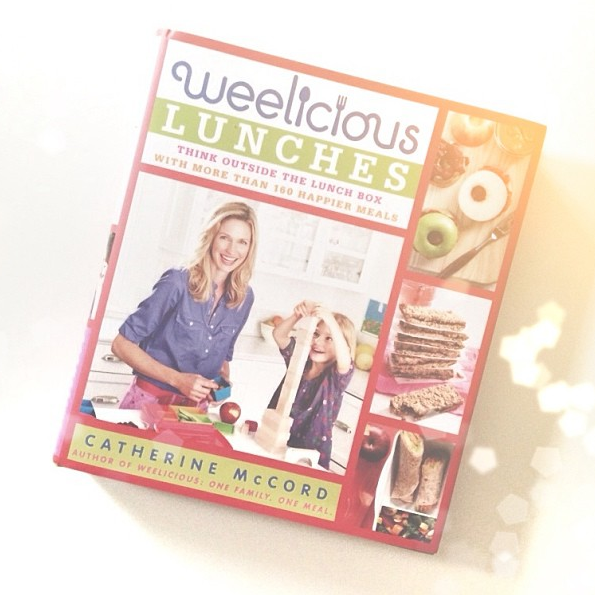 I don't have kids (yet), but I'd probably want to eat everything in Weelicious's cookbook! I asked my husband your question, and he said that the MEANEST thing I've ever made him try is hearts of palm. He swears they're satanic. Also, he ate a cheese in Paris that was so gross it made him cry. Not even kidding about that. Have I even answered the question yet? That's a tough one, I sneak "weird" things into everything ;} I'd have to say anchovies in pasta and veggies into muffins. Tofu. My husband claims he won't touch the stuff and that I am never allowed to fix it for him. I love it! I made baked tofu one day by marinating it. I put some on his salad and he loved it! Spinach in brownies! They were yummy! I hide squash purée and grated carrot in muffins. My kids love them! Sshhhh... Also did zucchini chocolate muffins that they gobbled up. Moral of the story, you can hide anything in muffins. An all veggie lasagna packed with mushrooms so finely chopped everyone swore it was meat. So delicious! I have to trick my husband into eating mushrooms. I won't tell him if they are in a recipe I've made. I have tricked kiddo and hubby into eating the Tropical Avocado smoothie. This is a pretty common one among your readers - avocado! My husband despises it, and I put it in things all the time - chocolate pudding, smoothies, salsa, in sandwich spreads. He always fails to notice it. One thing I NEVER fool him with is vinegar. He claims he doesn't like vinegar... and whenever I try to sneak it in somewhere, he knows. I followed you on Facebook, Twitter, Pinterest, and Instagram. thank you! I tricked my ex into eating cauliflower by pureeing it into the sauce for mac and cheese. Any vegetable...my son hates them all. I hide them in whatever I can...lately, eggs have been working wonders -- I've put green beans, broccoli, avacado, sweet potatoes, and tomatoes in there. He also won't eat most meats by themselves, so I've thrown turkey in the scrambled eggs, too. Oh the joys of feeding a toddler. ummmm.... who knows. we eat lots of weird things?? but there's rarely trickery involved. he's pretty adventurous. Black bean brownies and avocado ice cream. Winning. Brussel sprouts. Although fortunately for me, he loves them! Silken tofu in a cream sauce. not much he doesn't like, but i like sneaking in an extra serving of vegetables when i can! Cauliflower puree passed off as mashed potatoes (and hubby says he doesn't like cauliflower...)! I don't think my other response went through - oy! Here it is again if not...I made my husband a "meat" sauce with tempeh once and he wasn't tricked for very long BUT he really liked it and I make a buffalo tempeh meal that we both are obsessed with. He is a more adventurous eater now and doesn't mind when I throw in new ingredients, hurray! My kids hate veggies and I've been known (or unknown rather) to sneak veggies in meals! They haven't caught on yet! I do spinach fritters and put half spinach, half kale. I've made a cauliflower alfredo sauce, but everyone who ate it was aware of what was "hiding" inside. Baby food in meatloaf. Peas, squash and carrots. I was told it was the best meatloaf I've made. I've tricked my kids into eating prunes. I smear them on toast with peanut butter and called it jelly. Once they started eating solid foods, prunes became very important in their diets. I tricked my husband into eating brownies made with black beans. And it's possible that I don't tell my FIL that the Chicken Casserole he LOVES has mushrooms in it. I follow you on Instagram. Can't wait to see the baby pics! My husband eats pretty much everything, but I just found out he does not like sweet potatoes. I am growing some in the garden, and even though he made me agree to not try to make him eat them (after he suggested we pull them up and destroy them after he found out what they were), I cannot wait to sneak them into everything he eats. I sneak weird food to myself all the time though. I am picky so I just puree stuff into applesauce consistency and then I feel really sneaky when I like it. once i fed him soy chorizo and he believed it was the real thing! My husband & toddler daughter eat pretty much everything, so I've never really had to trick them into eating anything! It did surprise me that my daughter liked the Indian food we ordered recently though. We'll meet you in New York, k? Chickpea blondies! They loved them.